Kerala Piravi marks the birth of my dear state 'Kerala'. Kerala state was officially created on 1 Nov 1956 and therefore November 1 is known as 'Kerala Piravi Dinam' - The Day Kerala was Born. So today I wish all the Keralites around the world a great 'Kerala Piravi Day'. Even though there are some dark shades and wrinkles on the cheeks of this 55 year old beautiful lady, She still looks so pretty with the wonderfull greenery you will ever see. The exotic wildilife, pure waterfalls, beautiful plantations and paddy fields, hill stations, backwaters, wonderful Ayurveda, enchanting art forms, colorful festivals and above all the Kerala Cuisine makes it so special and unique. I just love each and every moment I spent in my homeland and is still eagerly waiting for my next trip to Kerala. 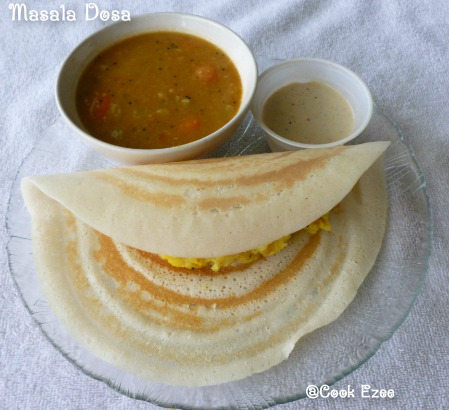 So dearies on Kerala Piravi Day I'm posting the all time favorite dish of Keralites-'Masala Dosa' which is the one of most popular dish in India as well. The origin of Masala dosa/Dosa is still on debate but you can find refridgerated set of dosa batter in all the South Indian homes. Masala dosa is a fermented crepe made from rice and urad dal batter stuffed with cooked spiced potatoes and is a very common breakfast dish and street food as well. When I came to USA I didn't have much south Indian friends around but yea still was really lucky to have a whole bunch of North Indian friends. For any parties and gathering they just wanted to have dosa-sambhar/masala dosa and Uzhunnu Vada(Urad dal vada) which made my parties much easier. Of course I happened to learn a lot of North Indian cooking from them as well. Thats when I understood how popular our simple and humble dosa/masala dosas are. Everytime they meet me they ask me the rice-dal ratio for making it and try hard to get them perfect. So friends let me post the recipe for the all famous Masala dosa, Enjoy!!!! Wash and clean the rice and urad dal and soak it for 7-8 hours. Grind everything in a mixer to a smooth batter. Batter should not be too thick or runny, it should be of smooth pouring consistency. Add salt and stir well, set aside for the batter to ferment for atleast 8-10 hrs or overnight. Heat up a frying pan, pour oil, add mustard seeds. When mustard seeds crackles add urad dal, curry leaves, red chillies, salt and stir for few secs. Add onion, green chilly, ginger and saute till onion turns translucent. Add turmeric powder and potatos. Pour water and stir well to mix everything. Cover and cook it till potatos are soft and water is almost absorbed. Mash some potatos, stir well and chck for the salt and taste. Finally add the chopped coriander leaves and mix everything. Potato masala for the Masala dosa is ready. Heat a non-stick dosa pan or griddle, pour a big laddle of batter and spread in a circular motion to get a big round dosa. Drizzle half a spoon of ghee or oil on the egdes and middle of the dosa if desired(optional). Cook till the dosa become crisp and golden brown, do not get to dark brown. Take out a big spoon of potato masala and top it in the middle of the dosa. Fold te dosa into half and take out of the pan. Repeat the process with the rest of the batter and masala. Serve immediately with Sambhar and coconut chutney/tomato chutney. Note:- I tried using long grain rice that we get here in US as well and found perfect for dosas/Idli. Authentic Kerala recipe,looks yummy platter!! Happy Kerala piravi day to you..
Dosa with masala luks Yumm and deliciously crisp.Luv it. Wishing u a happy kerala piravi day too...Dosha is looking crispy ! Masala dosa looks yummy and tempting.